fect for kids. Or splash, or surf, in the waves, or stroll along the 1/2 mile of the gorgeous beach. Or if you just want to sun bathe, grab a book from the Library, in the beautiful Plantation clubhouse, or watch the amazing sunsets from it's lanai, at day's end. also take an underwater submarine voyage, or sunset dinner cruise. Lahaina also has the biggest banyan tree in the world. Lahaina is THE place for activity, and has the only real nightlife on the island. Only 10 minutes beyond, is world famous Kaanapali, where you can find golf courses, high- rise hotels, and more activities to enjoy. And just beyond that area, is Kapalua, with more golf courses, and the Ritz Hotel. the seven sacred pools, horseback riding safari's, and rain forests. Or take a scenic helicopter ride around the island, to take in all it's beauty, at once. 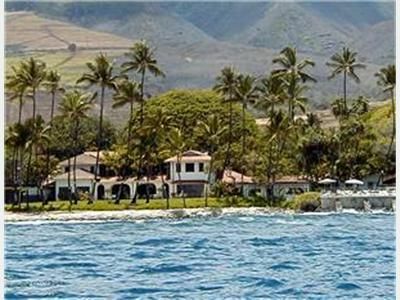 That's why Maui was voted the # 1 island in the world, by Conde Nast Traveller, for an unprecedented 16th time. The blue bath has a shower, and is in the bedroom. The green bath has a shower, and is just a step outside pastel bedroom. The powder room is downstairs, off the entry hall. 2 folding chairs available also. There is New Central Air Conditioning throughout the home, as well as Ceiling Fans in each room, and the lanai. There are 2 Flatscreen T.V. 's, 2 DVD Players, 2 VCR's, 2 - I POD/ I - Phone Dock / Players, CD Player, as well as Complmentary Wi - Fi, and local phone service. G.E. Stainless Steel Refrigerator, Range, & Dishwasher. Microwave, Washer / Dryer, Ironing Board. Kitchen has all amenities - Ice Maker, Blender, Coffee Maker, Toaster Oven, Foreman Grill, Waffle Maker, along with Weber Grill (charcoal), on lanai. All Utensils provided. All Linens provided, including Beach Towels. Unit remodeling needs to be completed and detailed to justify rental rate. Floors were filthy when we arrived, all my guests feet were dirty 5 minutes after we arrived because we took our shoes off, which we know is customary in Maui. I’ve stayed in several other units in the Puamana and never experienced such an uncomfortable stay. First bad review in some many years!!! Very strange when i received a text message from one of you stating that "you were so happy to be here". This condo was very well equipped and clean which was a huge plus from previous VRBO experiences we have had. The kitchen was very nice and the appliances were new. The living area could use some updated furnishings. Some renovations on the second floor and especially the bedrooms are needed desperately. This condo was very dated upstairs and the linens on the beds and the towels need to be replaced. The location is fabulous and the grounds are beautiful although the mosquito population was crazy high well we were there due to the rain this year. Loved the condo and all it had - 2 bedrooms,3 bathrooms, full kitchen and living area. With two teenagers there was Lots of space for everyone! I was impressed at how clean the condo was as well - I appreciate this. We enjoyed walking into Lahaina as it gave us some good morning exercise. Our only negative to the property was no hot tubs. Our first day was cold and rainy and we went looking for a hot tub but they don’t have one at this complex. We would definitely stay here again! Great place to stay. We stayed with another couple for 11 nights in this home. The condo was very clean, comfortable, and well equipped with all the essentials and amenities needed for our stay. There was plenty of space for 2 couples. We enjoyed that it was a quiet community and away from the crowds and the hubbub of Front Street in Lahaina. Great place to unwind after touring Maui during the day. Puamana property was beautiful and well maintained. We loved the pool overlooking the ocean. Great place to watch the morning sunrise, evening sunset and whales from a distance. We would definitely would stay here again and will recommend this property to our friends and family. Thanks David and Thierry for sharing your home with us. Leslie K.Where do you live? We could not have been happier with our surroundings ... Convenient, Clean & Comfortable. The kitchen and bathrooms have been recently remodeled; plus, the unit contains all the amenities and personal touches needed to cook or just kick back and relax. The Puamana grounds are spacious, peaceful, and away from the crowds; yet, close enough to walk/bike into Lahaina or the sandy beach next to the complex at a moment's notice. The central location made for a perfect home base for our many travels around the island. Most importantly, the Owner was extremely helpful, gracious and timely throughout our correspondence. This would be a place I would return to again and again. Great well equipped condo in the amazing puamana ressort complex. Walk to the beach or to Lahaina where you can go shop, get great food, and catch a submarine or snorkel boat, or even the bus to other parts of the island. Though many people rent cars when visiting Maui we did not feel it was really necessary in this centrally located complex with easy 15 min walk to downtown Lahaina as well as lots of Uber's when you did want a ride someplace. WEEKLY RATES are available No weekly rates available Thanksgiving, Christmas, New Years and Spring Break/Easter holiday rates to be applied.